Sometime when we use tranform activity inside BPEL, we face below error. 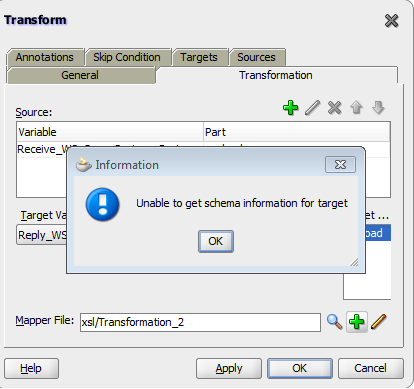 Error: “Unable to get schema information for target or source”. Above error occur when we use two schema with same namespace in our code. We generally use “Import” tag inside WSDL to refer schema. So if you still use “import” tag to refer two schema having same namespace then you will get above error. To resolve this error, we need to use “Include” tag instead of “Import” tag inside WSDL file. You need to make below changes as shown in below figure. How do we write an xsd in soa with an age limit of 25-60 for a person insured, and list the data types most used in xsd with syntax, please give an illustration this. You can go through below link.